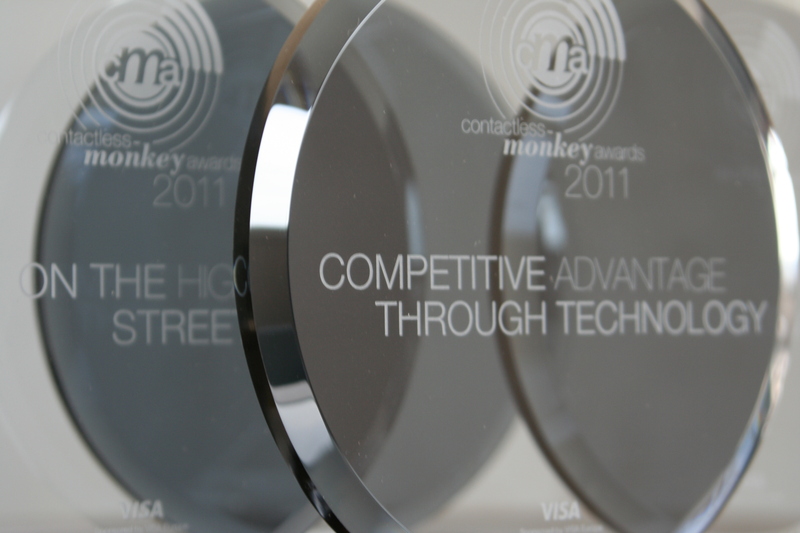 15th April 2011, Berlin, Germany and London, UK – The global appetite for contactless technologies shows no sign of abating, if the 2011 Contactless Intelligence Contactless Monkey Awards (CMA) are anything to go by. In addition, Visa Europe presented its Visa payWave award for Best Customer Experience to EAT, while Will Judge from Transport for London (TfL) won the Visa payWave Business Leader prize. Lewis Nolan, Vice President, Market Development for Visa payWave at Visa Europe said: “We are very proud to sponsor the Contactless Monkey Awards for a fourth year. 2011 is seeing significant growth of contactless technology across many European markets, and it is fantastic to see this reflected in the diversity of nominations and award winners. With close to 20 million contactless enabled Visa cards now in circulation across Europe and over 125,000 acceptance locations we will continue to see even greater growth as contactless moves into the mainstream. This year’s judges included Wendy Atkins, Contactless Intelligence; Nav Bains, GSMA; Paul Chamberlain, Association for Convenience Stores; Michel Barjansky, independent transport consultant; Lewis Nolan, Visa Europe; Kevin Farquharson, Smart Card Networking Forum; and Samee Zafar, Edgar Dunn. Krowne Communications is a specialized B2B PR agency. It was founded in Munich, Germany, in 2000, and is now headquartered in Berlin, Germany. Along with its UK company, Krowne Communications (UK), it offers agency services developed specifically to fit the requirements of major organizations operating in the high-tech world of security applications and identification. The company also develops and manages marketing communications projects for special interest groups and companies. It has pioneered the concept of marketing-oriented partner programs and digital PR integrated Web 2.0 media broadcast channels – through the Krowne Online Broadcast Network (KOBN). These B2B channels offer a revolutionary approach to nearly all marketing communication needs. Using the extensive industry network it has created over its lifetime, Krowne brings together the most important market players in order to communicate the developments within dedicated markets, to communicate the latest innovations and to demonstrate products using video and audio broadcasting. The KOBN platforms include Contactless-intelligence.tv, Security-news.tv and TECHevent.tv. Contactless-intelligence.tv is the contactless cards industry’s first and only podcast and video broadcast channel. It is operated by Contactless Intelligence (CI) – an innovative marketing platform for contactless technologies and applications which uses web 2.0 to deliver the latest industry news and views via a variety of media including podcasts and weekly news feeds. In Europe, there are 427 million Visa debit, credit and commercial cards. In the 12 months ending December 2010 those cards were used to make purchases and cash withdrawals to the value of €1.6 trillion. 12.5% of consumer spending at point of sale in Europe is with a Visa card, and more than 70% of that is on Visa debit cards. Visa Europe is owned and operated by more than 4,000 European member banks and was incorporated in July 2004. In October 2007, Visa Europe became independent of the new global Visa Inc., with an exclusive, irrevocable and perpetual licence in Europe. As a dedicated European payment system it is able to respond quickly to the specific market needs of European banks and their customers – cardholders and retailers – and to meet the European Commission’s objective to create a true internal market for payments.